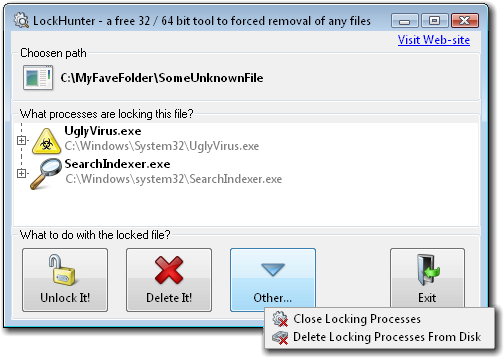 LockHunter is a free tool to delete files blocked by something you do not know. LockHunter is useful for fighting against malware, and other programs that are blocking files without a reason. Unlike other similar tools it deletes files into the recycle bin so you may restore them if deleted by mistake. @some guy : Not sure you understand what this utility is supposed to do. It runs in Windows not Linux. Ahhh,a 64bit unlocker utility finally! Pros: Allows unlocking/deleting of files in use by other processes. Cons: Prev update was Lockunter 3.2 way back in 2013??!! Does not seem to be very actively maintained. Bottom Line: @some guy : Not sure you understand what this utility is supposed to do. It runs in Windows not Linux.